When building an energy efficient home, High Performance wall assemblies are critical components, and can be grouped into a couple of categories: 1. Built on-site advanced wall assemblies and 2. Prefabricated walls, to include SIPs. Note that this blog post is largely dedicated to Polyurethane SIPs. ICFs, Insulated Concrete Forms, are a good option and are manufactured by several companies. Faswall and Nexcem have an interesting woodchip product. There are pros and cons for ICFs, and it is important to understand both. The goal is to improve the wall construction of conventional, stick built homes with advanced wall assemblies to include double stud, stagger stud or continuous insulation walls. Double stud walls consist of two stud-framed walls set up next to each other to form an extra thick thermally broken wall cavity that can be filled with insulation. Because the interior and exterior framing are separated by insulation, thermal bridging is reduced or, ideally, eliminated. Stagger stud walls use top and bottom plates that are normally 2×6 (5.5”) – 2×12 (11.25″). Vertical 2 x 4 studs are then staggered alternately on each side of the plates. This is a good option for extra insulation, reduced thermal bridging and sound-proofing of spaces as well. Another option is standard construction with a Continuous Insulation (CI) layer. In CI, builders add a continuous layer of insulation across the exterior of all structural members to reduce or eliminate thermal bridges, except for fasteners and service openings. Insulation is installed generally on the exterior of the building and is an integral part of the building envelope. Comfortboard 80 is an excellent vapor open product that can be used for a CI approach. Mineral Wool is generally favored, as foam tends to have low perm ratings and generally the desire is for our walls to dry to the outside. Often folks using a CI approach do not use enough insulation to move the dew point outside of the wall assembly. It is critical to have a vapor open approach if the dew point falls within the stud cavity. Phoenix Haus, which designs and produces open sourced housing templates for walls that save energy, provide better insulation and allow homes to be more efficient with or without solar energy. Build SMART simplifies the process of building a high-performance, energy-efficient structure with factory-manufactured modular components. Continuously insulated panels come with pre-installed, energy-efficient windows and doors and are delivered to the building site. SIPs – Structural Insulated Panels. There are several types of SIPs out there. Generally, the difference between SIPs is the insulation. Most are made with OSB (oriented strand board) skins, but some SIPs have different skins to include metal or MgO (Magnesium Oxide) skins. Most often, the insulation is EPS or Polyurethane. However, there are some that are made with mineral wool, PolyIso (Polyisocyanurate) or XPS (extruded polystyrene). Some SIPs are not considered structural (e.g. most metal SIPs), and they might be referred to as Sandwich Insulated Panels. SIP panels made of EPS, XPS or PolyIso are glued together generally with Polyurethane adhesive. SIPs made with Polyurethane foam are adhered together with the foam itself creating a tremendous bond and a very strong wall panel solution. 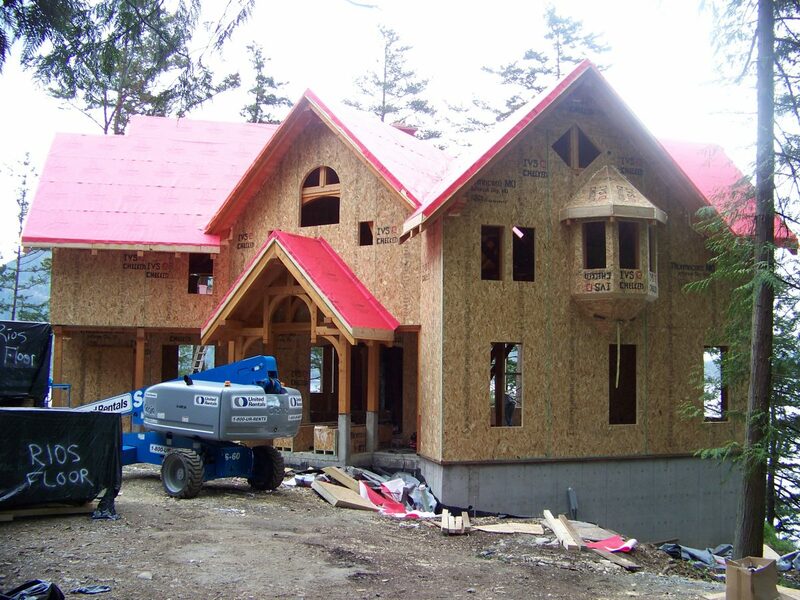 Thermocore SIPS are made with polyurethane insulation core with interior and exterior skins of OSB. Panels are precisely and custom manufactured to the architectural drawings. Included in the SIPs are door and window bucks, headers, sub facia and electrical conduit boxes. Also, beam pockets and additional structure like 2x, LVL or steel posts can be built into the panels. Construction with Thermocore SIPs is quicker than framed homes. The time from foundation to dried-in is significantly reduced. Labor costs are lower, which is ideal in places where available labor is scarce, costly, unreliable or poor quality. Thermocore SIPs are stronger than framed walls, with lower thermal bridging. Thermocore SIPS often have higher material cost, the electrical requires pre-planning and can be considered less environmentally friendly due to foam, which is a petrochemical product. The thermal performance values of SIPs and lower labor costs often make up for the initial cost and planning. SIPs help to achieve a more air tight building as well. In the Passive House and Zero Energy industry, where energy efficiency, comfort and clean air are the goals, Thermocore SIPs are an optional building solution. For more information on SIPS, call us at 720-287-4290. Next Next post: What is Continuous Insulation and Why Does It Matter?